May motion analysis help ASD early diagnosis? Autism Spectrum Disorders (ASD), grouping besides autism, a wider spectrum of symptoms, refer to a series of abnormal manifestations of cognitive development that can emerge in babies between 6 and 24 months, for example: deficiency in verbal and non-verbal communication, deficiency in social interactions, repetitive and stereotyped behaviours. Autism is classified as neurological pathology and it has been detected for the first time in the early years of 1900. Since then the disease has been object of study, because what triggers it has not been identified yet, even if undeniably a genetic component seems to play an essential role. Notably, researches focused on early diagnosis, because it has been observed that it is fundamental to detect the pathology as soon as possible, in order to tailor appropriate interventions, for the benefit of present and future baby’s life. A recent study by Carolina Institute for Developmental Disabilities from University of North Carolina applies neuroimaging techniques with the aim of identifying babies having the highest risk to develop the pathology, in the frame of early diagnosis (http://stm.sciencemag.org/content/9/393/eaag2882). They used functional magnetic resonance on 6 months old babies to detect brain areas that show abnormalities and that therefore could be an indicator of future development of ASD. The study involves also the implementation of machine learning techniques for correct automatic detection of neural connections. However, this is not the only possible approach: here in Ab.Acus we focused on ASD early diagnosis, but exploiting a behavioural criterion. It has been observed that there is a correlation between involuntary movements of limbs typical in newborn babies (so called general movements) and the possibility to develop some neurological deficits: if abnormalities are detected in these movements, an atypical neuromotor development could later appear (https://www.ncbi.nlm.nih.gov/pubmed/18403821). This is the starting point of our work, aiming at assessing a correlation between general movements and ASD. So far, general movements have been observed mainly qualitatively, involving an operator’s contribution in terms of a “by eye” analysis, so we thought to improve this approach, making the analysis process easier and quantitative. 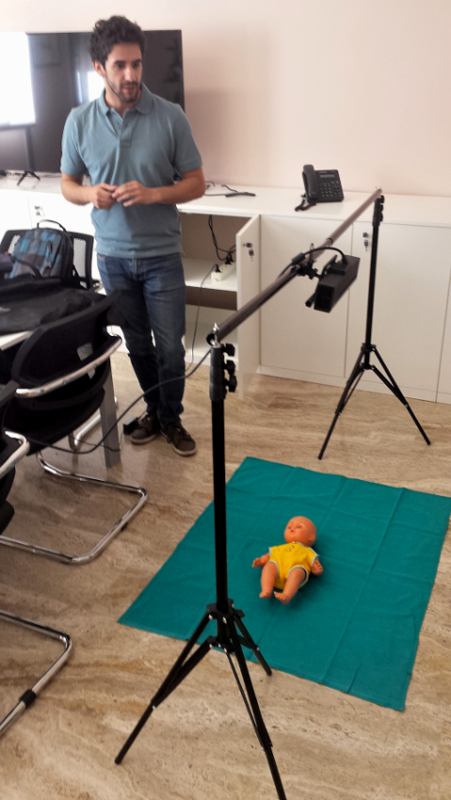 The whole project is running in cooperation with Istituto Superiore di Sanità (http://www.iss.it/) within the framework of the NIDA (Italian Network for early Diagnosis of Autism spectrum disorders) project and consists in the realization of 2 software packages: the first, called MOVIDEA, analyzes existing babies’ videos implementing a semi-automatic tracking of limbs trajectories, from which it is possible to compute more than 50 parameters that have been already used in the past for general movements studies. Videos may be recorded with standard cameras, allowing a two-dimensional tracking of the limbs’ movement. In addition to this, to improve tracking quality and increase information content, our researchers thought to record videos using a Kinect, a device with a RGB camera and a double depth sensor based on infrared technology. This allows the acquisition of three-dimensional data mapped to usual RGB videos providing a more accurate description of limbs trajectories. It was therefore developed the software called Kina in order to enable the recording through Kinect and enter a series of descriptive data about the baby and his/her family, useful for further statistical investigation. One strength of the research is certainly the quantitative support to general movements analysis. As Ab.Acus R&D Director Maria Bulgheroni explains: “The semi-automatic tracking system permits to extract parameters that are easily comparable to one another. This means that all results can be shared and used to integrate the visual analysis”. We also asked her in what terms this approach is different from the others, for the example the one based on FMRI. She said: “If the research proves the correlation between general movements and ASD, our work can provide a less invasive acquisition of data. We developed a portable system, based on a simple commercial low-cost hardware”. Our software packages want to help significantly ASD research: Kina movement acquisition with 3D information and MOVIDEA facilitating the identification of specific motion patterns, so to pave the way to an earlier intervention in case the syndrome is detected. What future for wearable sensors in clinics? Robot development and design: what about ethical aspects?